Concerts: Metal Church, Comaniac, Glasgow Audio June 21st 2017 - Sea of Tranquility - The Web Destination for Progressive Music! First up however were Switzerland's Comaniac, a late replacement on the tour in place of US newbies, Meshiaak. 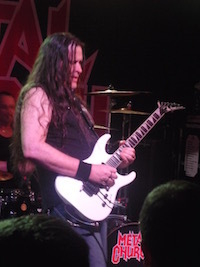 Having brought enough merch to open their own department store and t-shirts with designs that suggested everything from extreme metal to prog rock, the band hit the stage revealing a love for Megadeth; although not so much in their sound but certainly on the shirts of both guitarist Valentin M�ssinger and his lead singing six-string partner Jonas Schmid. Thankfully this lot are no tribute act, the crunch of Mustaine certainly noticeable in Comaniac's biting riffs, but with a sound pulling influences from right across the 80s US metal and thrash spectrums, while this four piece offer little new, neither are they mere copyists. Incorporating (very) occasional growls, Schmid is a singer capable of a high end bark that belies his strongly accented speaking voice � that even he laughingly suggested made him sound at some points like a mad Frenchman and at others an intimidating German � although that was hardly helped by him delivering his stage raps with full vocal effects switched to the max! Either way, as a frontman and focal point for the band he does a good job in an old school way and backed by the occasional shouts and yelps from M�ssinger, the pair make a mighty partnership. With the likes of "Coal" and "1, 2, Rage" quickly winning over a skeptical audience, it was set closer "Cut Throat" that proved this lot can add a technical edge to their unashamedly vintage attack. 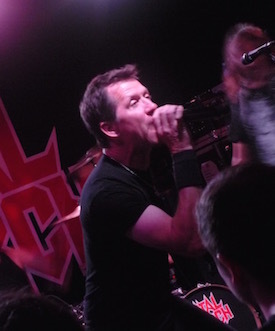 There's no disguising that the return of singer Mike Howe to the Metal Church ranks has brought the band fresh impetus, his stunning vocals the catalyst they needed to record their best album in over twenty years, if not longer. And it's clear from the off that his enthusiasm and seemingly boundless energy is also a real feature of the band's live show. However with lynchpin Kurdt Vanderhoof clearly having a ball, he's not alone, Metal Church not in the mood to take any prisoners as the riff for "Fake Healer" kicked the set into life. Or it would have done had a glitch with the onstage sound not brought things to an untimely halt before they'd even reached the chorus. Technical fault fixed, things started over, the crowd already caught in the moment as Vanderhoof and lead guitarist Rick Van Zandt traded licks and riffs as though their lives depended on it. 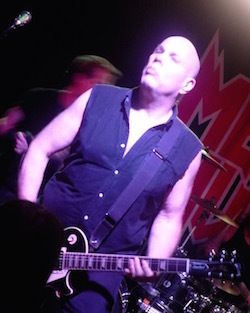 With the return of Howe allowing the band to focus on the three classic albums he fronted between 1988 and 1995, the nostalgia trip the fans wanted was delivered through the belting "Date With Poverty", "In Mourning" and "Gods Of Second Chance". 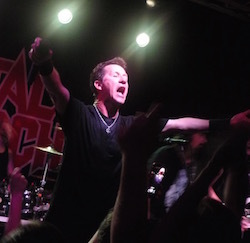 But Metal Church aren't resting on their laurels, four brand spanking cuts from XI proving this band are back on top form in the studio and on stage. It may be sacrilege to say it, but it's hard to argue that the best moments on show weren't "Reset", "Needle And Suture" and "No Tomorrow". Although if I had to choose a stand out track, it might well have been "Killing Your Time", also from XI. That said, "Beyond The Black" and "The Dark", from the two albums predating Howe's time in Metal Church, still hit as hard and with as much power as ever, the frontman ably bolstered by the superb backing vocals from bassist Steve Unger, the man of four strings oozing cool as he laid down the metal thunder and combined with the outfit's newbie, drummer Stet Howland. Although with the sticksmith no wet behind the ears rookie, proceedings had to be stopped as one delirious (or inebriated) fan proclaimed their love for the man behind the kit, prompting Howe to reference the drummer in the next song, humorously singing he was "no Stet Howland!" in an unexpected lyrical twist. Van Zandt too got his moment to shine, the tasteful, dazzling solo slot during "No Friend Of Mine" an illustration of how to show a guitarist's skills without boring the audience, although there's no denying that it's when he combines with the riff-master that is Kurdt Vanderhoof that Metal Church are at their mightiest. Much has been made, not least by Vanderhoof on stage tonight, about the return of Mike Howe to this band, but it really is worth stating just how imperious his performance was. After a twenty-plus year absence from the studio, it might have been understandable to wonder if he'd had a little 'help' in providing the jaw dropping return he did. Tonight proved he needs none of it, every note hit, held and delivered with an imperious force men half his age would be unbelievably proud of. It's no exaggeration to suggest this was one of the best, most passionate, vocal performances I've witnessed in my many years of gig going. With classics "Badlands" and "The Human Factor" closing the night out in phenomenal style, Metal Church confirmed they are back, they mean business and they are still one of the most exciting metal bands you could ever hope to see.